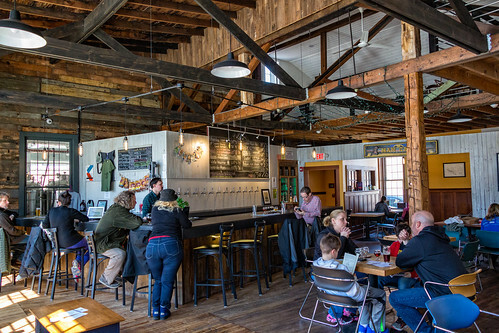 In recent years, there has been an explosion of new breweries in the upstate New York region. 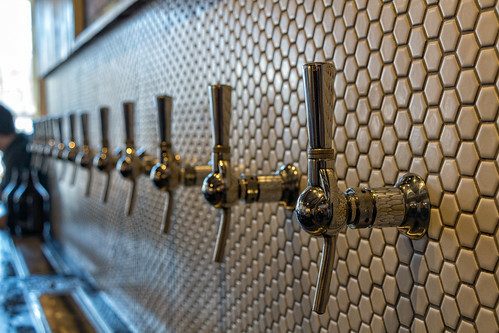 For many, it takes time to create a selection of beer that sets them apart from the crowd. 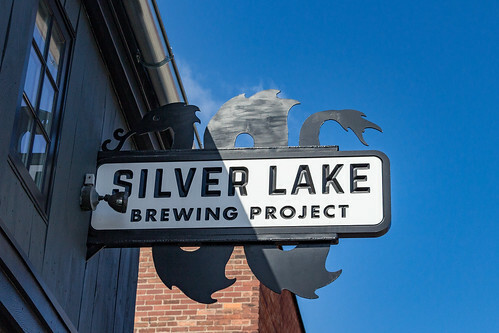 That was not the case when we first visited Silver Lake Brewing Project in Perry, NY back in April of 2017. We knew we had discovered someplace special. A year later, we still find ourselves returning to enjoy their unique take on many traditional and modern styles. Today we had the opportunity to stop in and talk with Pilar McKay, one of the founding co-managers, about the brewery’s history and what they have in store for the future. Upon arriving at the Silver Lake, we took a seat at the bar where Robert Hunzinger, a part time bartender, served us our flights. Luckily for us, it was still early so we were able to ask Robert and Pilar many questions about the beer before it got much busier. While we had tasted many of these beers before, it was refreshing to revisit them, imagining ourselves tasting them for the first time. Bright and clean with fresh orange and apricot notes, piney resin is restrained. Quite easy drinking, light with tropical notes that don’t overwhelm your palate. Real easy drinking Belgian, light amber color, noticeable malt but still dry. Hints of smoke intermingle with the delicious Belgian yeast. The perfect blend of spices, with well-balanced notes of chocolate and orange to round everything out. One of the nicer winter warmers I have had as I don’t care for the spice bombs. Notes of toffee and spice; warming with a bitter backbone imparted by Chinook. Full bodied, with a complex finish. Dark chocolate and toast come forth in the aroma. A balanced intermingling of spices, coffee, and Belgian dark candy. Nice and smoky, yet still very soft. Thick and spicy rye characters make this a beautiful concoction. Wow, this is dangerous! Easy drinking and well balanced. Bourbon notes come through beautifully. A dark, warming, mysterious beer that is best enjoyed as a slow sipper by the fire. I’d be hard pressed to find any flaws in the beer I had today, or any other time for that matter, at Silver Lake. Everything they produce is well-crafted, balanced, and unique. With a wide range of ABV’s and styles, there is always something available for every palate. I’d be remiss if I did not mention their Cream Ale, in my opinion one of the best in upstate New York. It was not on at the time of our visit but is well worth having whenever it is. If they ever decide to can or bottle their beer, I think the cream ale would be a huge success. I also love seeing recipes like Moe S., a sessionable beer that won’t leave you unable to have another. The brewer manages to pack a lot of flavor into this well-made pale ale. The current customer favorites are Moe S. and IPA 7, with the Winter Warmer also being a huge hit over the colder months. 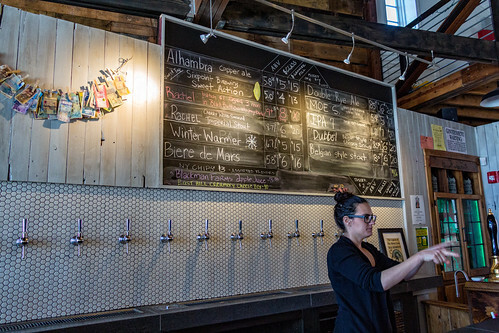 We talked to Pilar about the brewery and how it came to be in Perry, NY. Silver Lake opened on March 3rd, 2017 and has 3 co-managers and 40 investors. It was originally funded in part by a Kickstarter campaign in 2016 which was highly successful. Pilar is happy to report that they met all goals and fulfilled all the projects that were part of the campaign. Pilar grew up in Perry, before moving to Ithaca and then California for school. 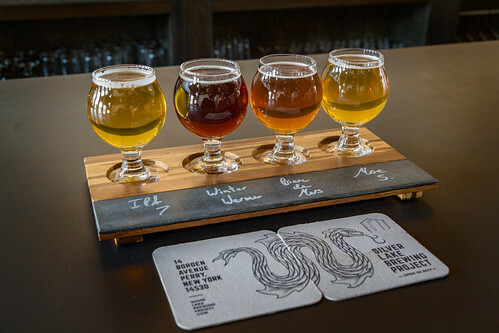 During her diverse travels, she discovered the craft beer scene and fell in love with some of the beer from breweries like Ithaca Beer Company and Middle Ages Brewing Company. After moving back to Perry, Pilar and Ryan Fitzsimmons, the second managing partner, discussed the future of the region at the end of the annual Perry Shakespeare Festival, an event she helped co-found. They realized that Perry, NY attracted a lot of young people, and its proximity to tourist locations such as Letchworth State Park made it an ideal location for a brewery. The trifecta was completed when they met up with the third business partner, Tony Jones. Tony was a homebrewer from Geneseo putting out some unique and interesting recipes. Once the three of them got together, the rest was history. The “project” was started and has succeeded incredibly well so far. Pilar stresses that the brewery’s focus is on community. While they are pleased with the outpouring of support from tourists and those from afar, they wanted to create a communal location that was desperately needed in this rural section of upstate New York. It is within walking distance of the shops and restaurants on Main Street and has become a frequent stop for movie goers at the Drive-In theatre before shows. Wyoming County is becoming a four-season destination and the variety of people they see come throughout the year is indicative of this. As a female business owner, Pilar also wanted to make sure that the atmosphere felt open and welcoming to everyone who comes through the doors. Silver Lake is located in a building with some interesting history behind it. Back in the late 1890’s the structure contained the horse stable for nearby Hotel Perry. By the early 1900’s, it was converted to The Alhambra, a silent movie theatre which was very popular. With the advent of talkies and bigger cinemas, The Alhambra closed its doors and was converted into a newspaper printing press and newsroom until three years before Pilar and her team took over the site. It was rumored that Brock Yates, the inventor of the Cannonball Run, even kept an office here. 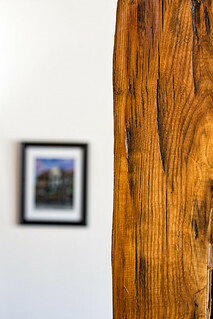 Today, Silver Lake has done an incredible job of renovating the space. Original steel tresses are still visible, and the use of open wood framework creates a warmth that enhances the atmosphere of the brewery. 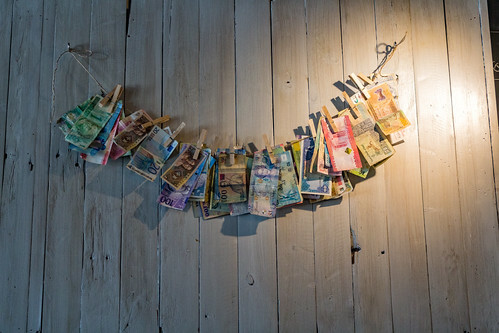 The walls have rotating displays of artwork from local artists and one cozy corner is fitted with comfy couches and plenty of board games to choose from. Sometimes when we visit, the brewery leaves a game on each table inviting patrons to have fun and try something new. 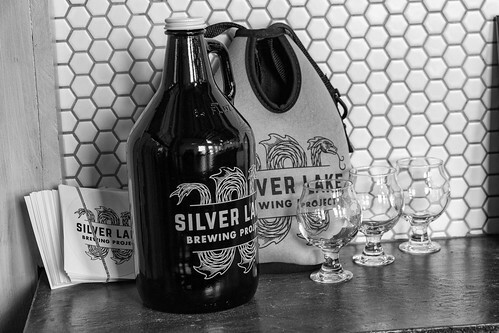 Tony Jones’ many years of home brewing have resulted in some pretty exciting recipes to try at Silver Lake. 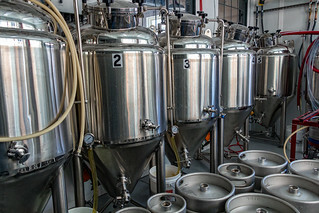 Brewing on a three barrel system with seven fermenters, Tony likes to experiment with many styles. With an extra interest in French and Belgian beer styles, expect to see more like Biere de Mars, made with Belgian Abbey Ale yeast, as well as other recipes not often found locally. When the brewing process is complete, spent grain is given to local farmers in Dansville, helping with Eco-friendly waste removal. Tony plans on incorporating more lagering and aging into future beers as he continues to refine the process. His barrel aged beers have been quite successful so expect to continue to see collaborations with Black Button and other distilleries. While food is not prepared on site, it can be ordered in from many of the local restaurants like Hole in the Wall. East Hill Creamery cheese, located right down the road, and potato chips made in nearby Gainesville, NY are available for purchase. Pilar hopes to expand into the rest of the building within the next 18 months to incorporate their own restaurant and food service. 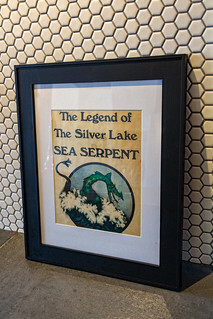 Merchandise for sale includes t-shirts featuring the infamous sea serpent that was first written about back in 1855. 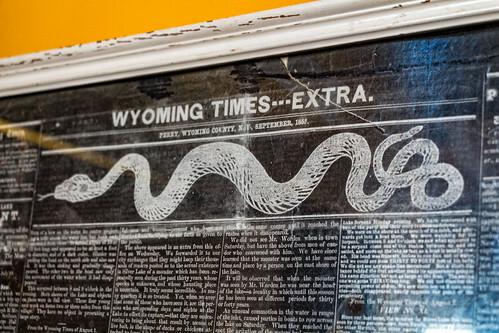 In fact, they have the original story from the printing press sheet hanging on the wall. Pilar and co-managers are researching the use of a mobile canning line, but just keeping up with the tap room and local accounts has been enough for now. It is important that they retain their focus on participation and interaction with the community. Pilar loves talking to the customers and staff, enjoying the special events that are setup throughout the year. Improv and Stand-up Comedy nights were both initiated by one of the bartenders and have been huge successes. Concerts are performed monthly with special focus on local performers. When the weather is nice, a small outdoor patio provides additional seating. 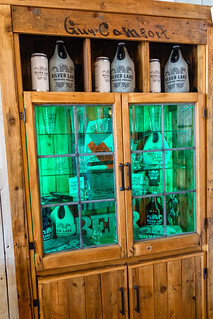 I love spending time at Silver Lake Brewing Project and look forward to my drives down through the scenic countryside. The brewery has an exciting selection to choose from and the relaxed atmosphere allows us to sit back and play a few games to pass the time. This makes a perfect stop if you are camping at nearby Letchworth or just are on the lookout for some excellent craft beer. I look forward to the day when they might start canning, but until then, crowlers and growler fills are available. 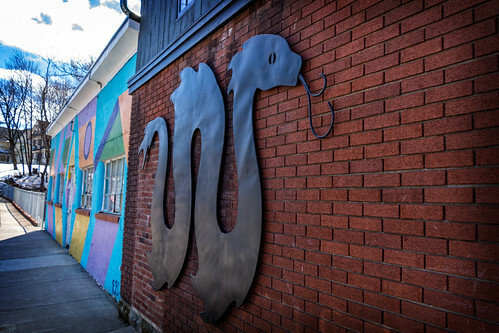 And who knows… maybe you will spot the infamous sea serpent if you find yourself driving by the lake! 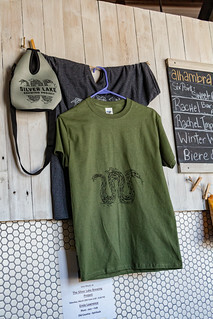 Less then ten minutes from Silver Lake Brewing Project is Letchworth State Park. For those of you who are unaware,this 17 mile long park is known as the Grand Canyon of the East due to its many waterfalls and deep gorges. The falls are spectacular any time of the year, and a walk to the bottom of the gorge is a must do activity in warmer months. Plenty of camping opportunities abound and there are lots of quality geocaches to find while exploring the woods. Letchworth is truly a gem and should not be missed! Blog post written by Thomas Andersen. This entry was posted in Breweries and tagged Brewery, New York by tanders1. Bookmark the permalink.